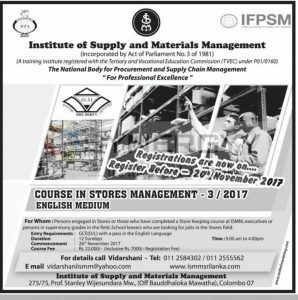 Institute of Supply and Materials Management invites applications for the Course in Stores Management for November 2017 batch. This programme will suits for persons engaged in stores or those who have completed a store Keeping course at ISMM. executives or persons in supervisory grades in the field. School leavers who are looking for jobs in the Stores field.